We've decided our Sawtooth Flooring is damn good looking – especially in Ash and Reds! 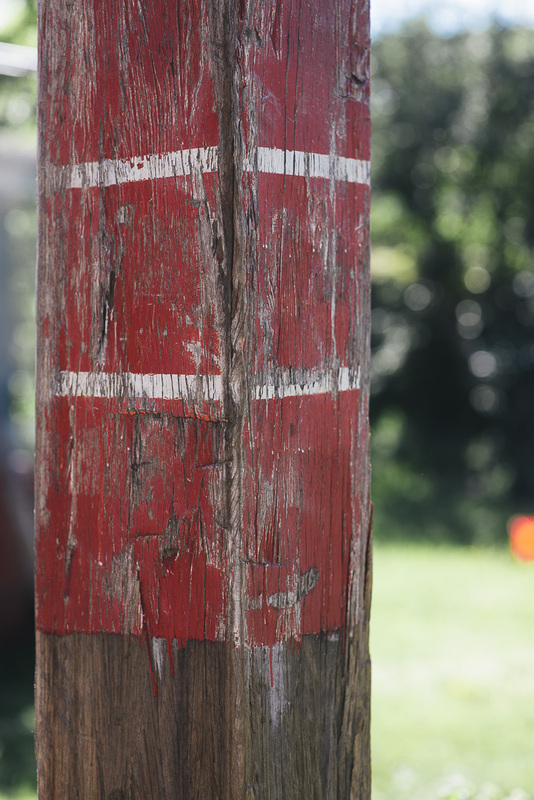 After some experimentation we discovered that the Ash and Reds both suit the tactile aesthetic of the rustic dressing really well. The light, blonde nature of Ash is a striking contrast with the dark checking and markings from the saw blades and the warmth of the Mixed Reds suits the aged patina really well. Check out some installations and more info here. 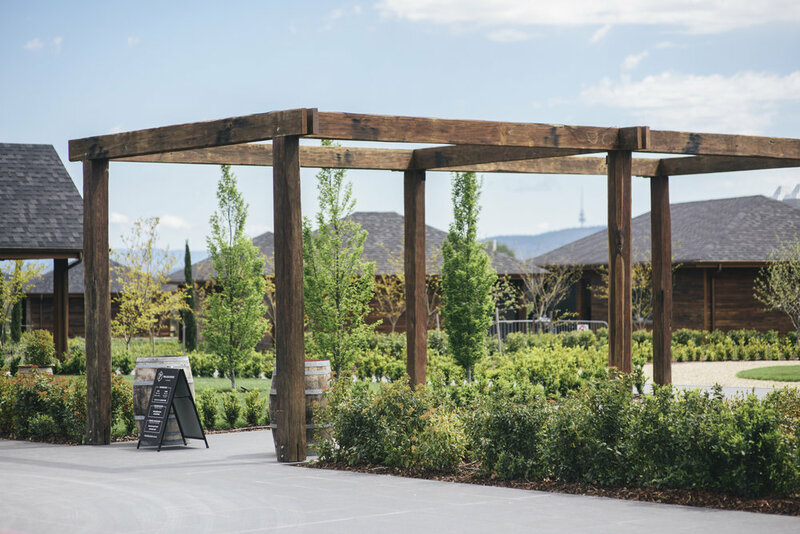 Our hunt for a new location that can be home to our entire operation continues, and we are starting to get a clearer idea from the ACT Government on the timeline for our move from the Brickworks. In the meantime, we have to face the reality of moving - which is going to be a big job - but the team is onto it and we’re getting excited about the preparations. We’ve started to clear out excess stock and lean down – check out our Floor Board Pack Sale and the specials we have on Eclectic Cladding. We’re sifting through options on potential locations now. A few really exciting options have come in and we’re getting close to knowing if one of them is going to fly. One issue we face is the planning and approval times required for some potential locations. This is something we are hoping the ACT Government will be able to expedite. Read more. We’re humbled, amazed and chuffed. The response to the news that we’re looking for a new home after 23 years at the Yarralumla Brickworks has been incredible, thanks to you all for your positive support. 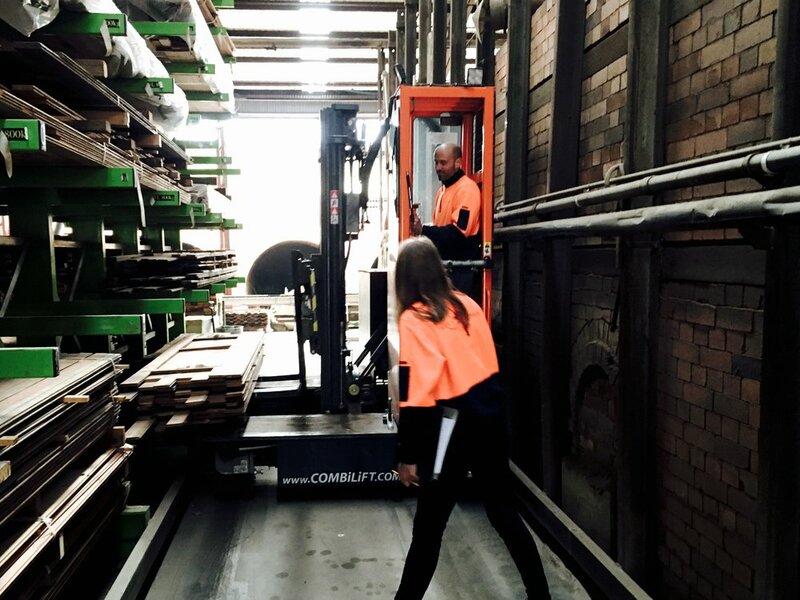 We’ve loved working among the old buildings at the Yarralumla Brickworks all these years. It’s an amazing space, full of history and character. But with the ACT Government’s final decision to sell the site we have no choice but to pack up and head out. We’re looking in earnest for a new home, but it’s challenging. Read more. Recycled Timber Decking Now Available! We have developed a pretty awesome system for turning salvaged house roof timbers into decking boards! 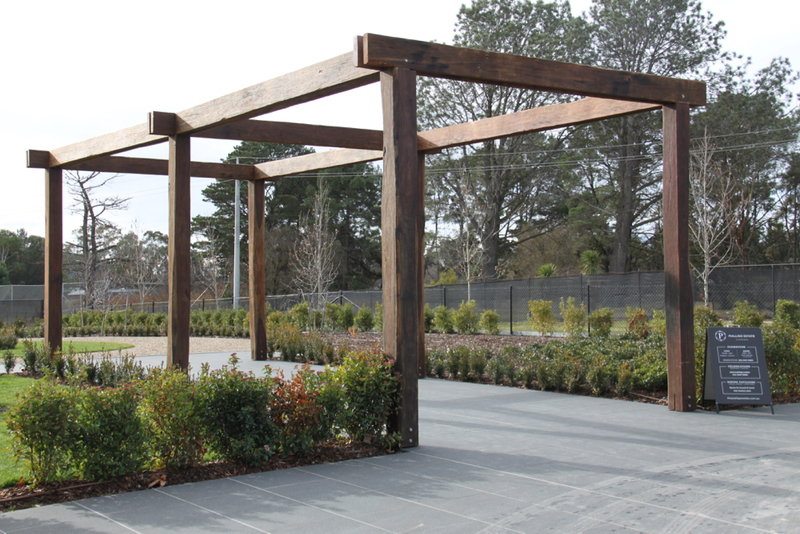 Thor’s Hammer salvages structural timber from warehouses, bridges and wharfs which are perfect for use in pergolas, and as garden features like screens and seats. New Recycled Timber Floor Board Product! Super hard wearing saw tooth floor boards in stalled at Bent Spoke brew pub in Braddon, Canberra. Super hard wearing saw tooth floor boards installed in a home kitchen. Installation of saw tooth floor boards is fast and efficient with newly milled tongue and groove profiles. Thor’s Hammer has developed a new recycled timber floorboard product! 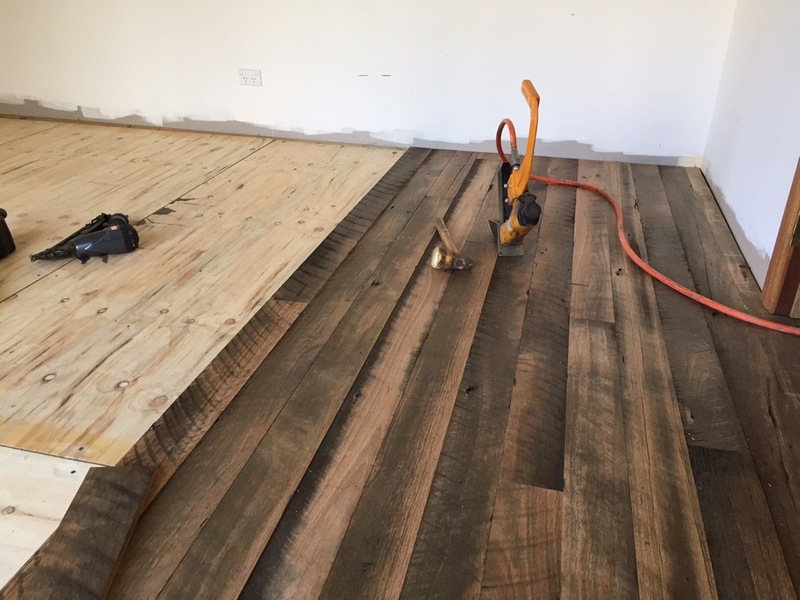 Our new ‘saw tooth’ flooring retains the patina of the demolition timber it was made from. It is hard wearing and durable, easy to install and the finish can be customised to the client’s specification! Thor's Hammer - Revolutionising Firewood! 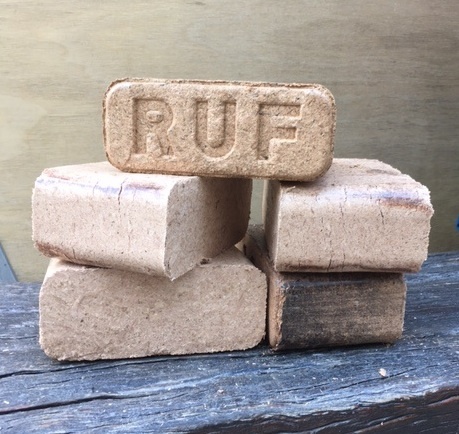 We are very excited to announce Thor’s Hammer is now selling the most efficient and environmentally friendly fire wood (briquettes) on the market! We are now into the new year in full swing and thought we would put together a collection featuring some of the amazing jobs we were lucky to work on in 2015. It's been a hive of activity at 'The Hammer' with so much happening in the workshop before Christmas! We are having a collaborative exhibition! 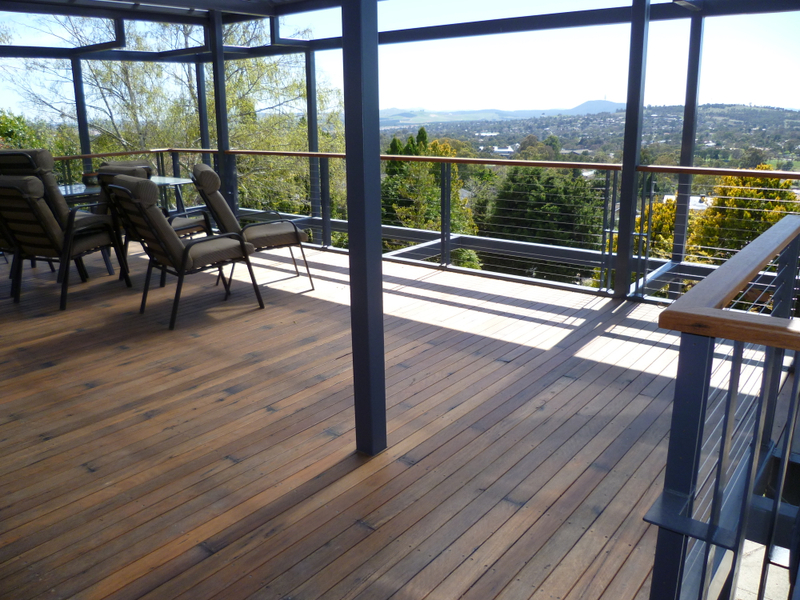 Decking re-milled from recycled Spotted Gum rafters to match the salvaged flooring used inside the residence. 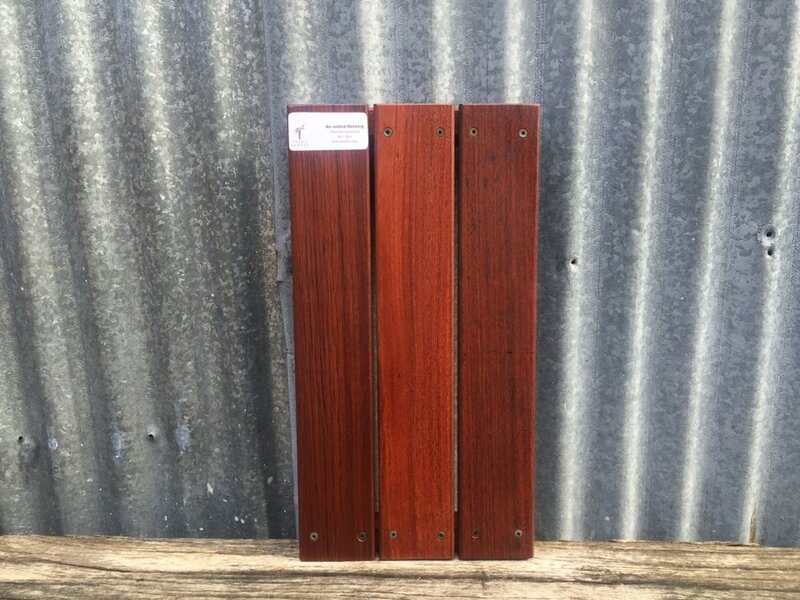 Recycled timber decking samples shown at three different finish levels. From left to right: rustic brushed finish, lightly dressed and fully dressed. A well designed and constructed, covered deck will give years of low maintenance use! 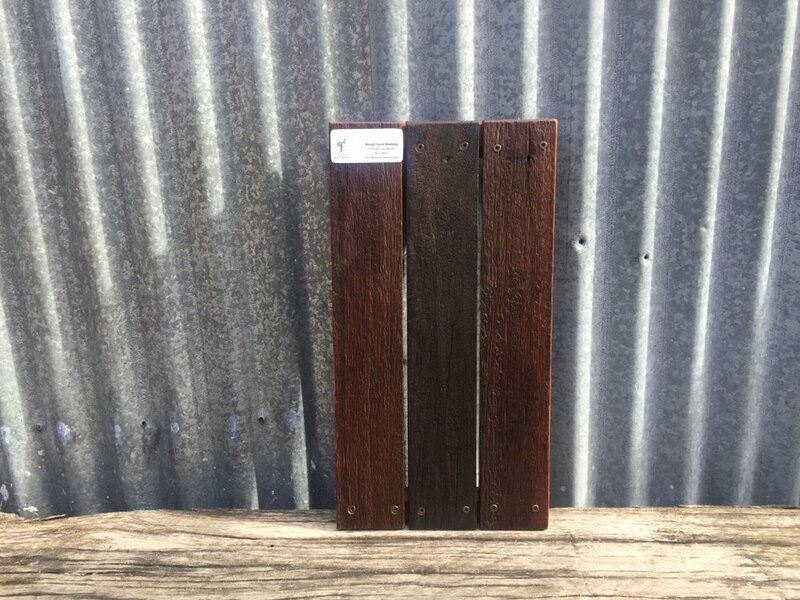 Blackbutt sample decking at our showroom at the Brickworks in Yarralumla, Canberra. 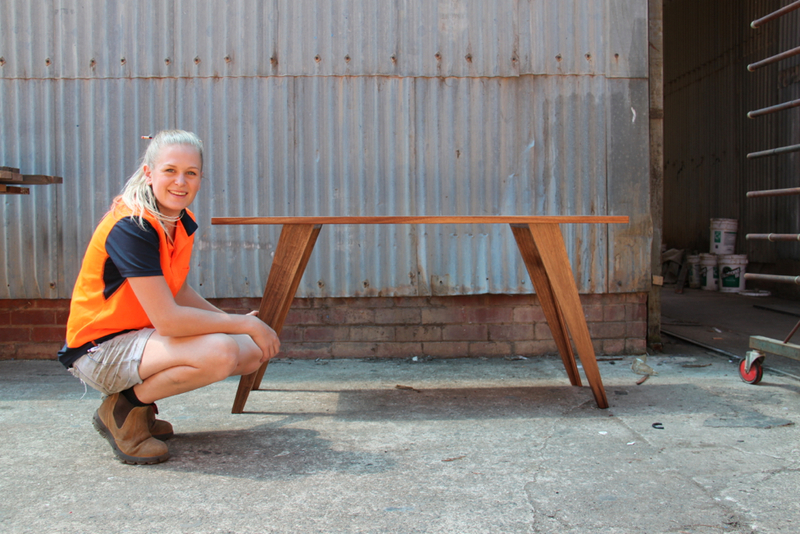 Thor's Hammer specialises in salvaging high quality timber from demolition sites, saving it from landfill and turning the recycled material into high quality furniture. This video tells the story of how our furniture is made here at the Brickworks in Canberra, Australia. For over 20 years the team of master craftspeople at Thor's Hammer have used a combination of traditional hand skills and high tech machinery to create only the highest quality furniture efficiently, accurately and built to last. We will be back to business as usual on Monday 29th June and would love it if you came and visited! A vertical version of the frame and panel door made in recycled Mixed Red Hardwoods. The doors to BentSpoke Brewing Co. - made by others using our recycled Blackbutt timber which we supplied lightly dressed to keep the rustic face. This solid tongue and groove door is made with deep mortice and tenon joins catering for its size. 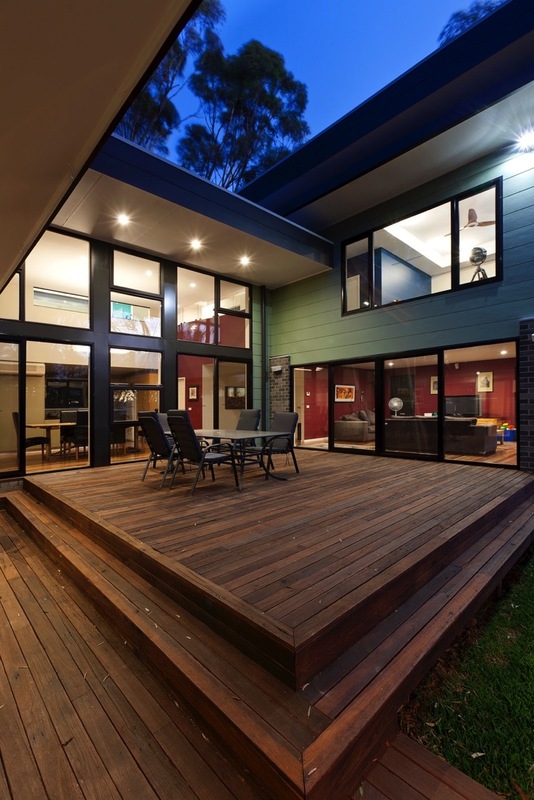 The timber used is recycled Blackbutt that has been skip dressed to maintain it's aged character. Frame and Panel door with glazing. 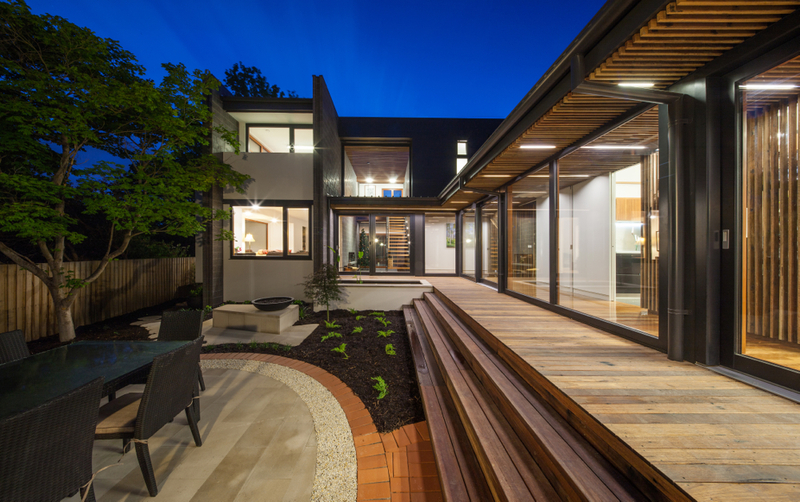 These double doors are made with solid recycled Blackbutt frames and vertical glazing panels. We can work with any type of glass, textured or plain, single or double glazing, so if you'd like windows of some form in your door or jamb, get in touch with one of our designers and we'll be happy to work through the design with you. This design is a variation of the vertical panel door available in the recycled timber of your choice custom built to suit your home. A custom order made from recycled timber and steel, for someone who wanted something extra fun! This door and jamb design was based on maintaining the aged patina in the timber. We skip dressed the Blackbutt boards used to achieve a good balance of character. This is a very solid and heavy door, with the tongue and groove boards a full 40mm thick. We supply 80kg rated German made hinges to suit this door. These doors were built with welded steel frames attached to wide Blackbutt tongue and groove boards - skip dressed and wire brushed to keep their aged aesthetic. In this design we have deep mortice and tennon joints in the corners and tounge and groove boards in the middle creating a very solid door. Built from recycled ash, avaialble in the timber of your choice. 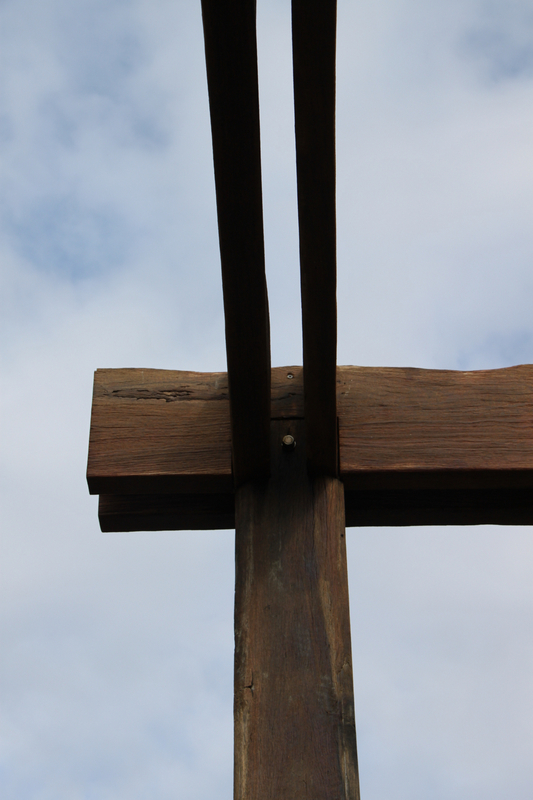 We have used a traditional ledge and brace construction method with recycled Blackbutt left rough sawn. The timber has been wire brushed and lightly sanded to remove splinters allowing the timber to retain it's full character. This photo gives you a feeling for the quality of joints in our door constcution, note the deep double mortises top and bottom for extra strength. Your front door is the first and last thing you and your guests see when coming into the house, you don’t get a second chance to make a first impression! We welcome Alison Balfour, the newest member of our joinery team! Our joinery team are always busy, carefully making pieces of furniture for our clients. Your table may take 6 to 8 weeks to create but it has been designed and built to last a lifetime! We always keep our eye out at demolitions for structural timber beams that we can salvage and turn into beautiful architectural columns and features for peoples houses. Often customers want us to bring back the colour of the old grey timbers without losing the character of the weathered surface. The saws have been fired up for our first day back in 2015!